2016 kicked off a new era at Dynamite for three massively popular characters in Red Sonja, Dejah Thoris and Vampirella. Later this year in June, Dynamite will be further celebrating their popularity with the release of three full-color deluxe calendars, each depicting twelve months' worth of timeless takes on an iconic heroine. Each calendar features 26 pages of gorgeous full color art for $14.99! "That's a combined 78 pages of action, horror, and adventure in three beautiful packages," says Alan Payne, Dynamite's VP of Sales and Marketing. 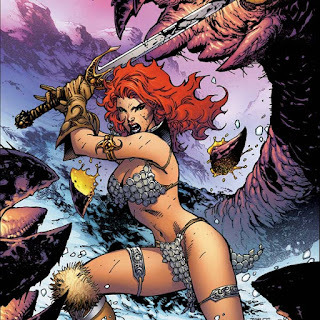 Even during the winter months, Red Sonja is no ice queen… she's a She-Devil! Fiery in spirit, skilled in combat, lusty and bawdy in her revelry, the crimson-tressed heroine looks gorgeous and grand throughout every month of the 2017 wall calendar. Proudly display these powerful portrayals of the fan-favorite swordswoman, courtesy of the artistic talent of Jenny Frison, Tula Lotay, Marguerite Sauvage, and more. Ignite your passion for the horror hostess Vampirella with the Classic Warren Era wall calendar! The most iconic imagery from Vampirella Magazine are captured twelve months of the year, depictions of her hypnotic beauty that once ensnared millions of lovesick admirers… and promises to do so again in 2017! An alchemical union of sensuality, horror, and a seductive wickedness, brought vividly to life by the greatest artists of the 1960s and 1970s, including Frank Frazetta, Jose Gonzalez, Enrich, Sanjulian and Jordi Penalva. For over one hundred years, Edgar Rice Burroughs' beloved creation, Dejah Thoris, has captured the imagination of science fiction and fantasy enthusiasts… and she'll continue to do so in 2017 on each and every page of this gorgeous wall calendar! Whether gazing over the extraordinary Martian vistas or commanding armies in battle against the four-armed Warhoons, the Red Planet's foremost heroine always appears with beauty and strength. Surrender to her regal presence all twelve months of the year! April 8, 2016, Mt. Laurel, NJ: The beginning of 2016 saw the launch of an all-new era for three of Dynamite's beloved leading ladies (Red Sonja, Dejah Thoris, and Vampirella), and this June, the publisher invites you to start preparing for 2017 with your favorite character! Dynamite is proud to announce three full-color deluxe calendars, each depicting twelve months' worth of timeless takes on an iconic heroine! Even during the winter months, Red Sonja is no ice queen… she's a She-Devil! Fiery in spirit, skilled in combat, lusty and bawdy in her revelry, the crimson-tressed heroine looks gorgeous and grand throughout every month of the 2017 wall calendar. Proudly display these powerful portrayals of the fan-favorite swordswoman, courtesy of the artistic talent of Jenny Frison, Tula Lotay, Marguerite Sauvage, and more! Ignite your passion for the horror hostess Vampirella with the Classic Warren Era wall calendar! The most iconic imagery from Vampirella Magazine are captured twelve months of the year, depictions of her hypnotic beauty that once ensnared millions of lovesick admirers… and promises to do so again in 2017! An alchemical union of sensuality, horror, and a seductive wickedness, brought vividly to life by the greatest artists of the 1960s and 1970s, including Frank Frazetta, Jose Gonzalez, Enrich, Sanjulian, and Jordi Penalva. Each calendar features 26 pages of gorgeous full color art for $14.99! "That's a combined 78 pages of action, horror, and adventure in three beautiful packages," says Alan Payne, Dynamite's VP of Sales and Marketing. Dynamite's 2017 Wall Calendars have been solicited in Diamond Comic Distributors' April Previews catalog, corresponding to an August 2016 release date. Comic book fans are encouraged to preorder calendars with their local comic book retailers. Fans and retailers are encouraged to follow Dynamite Entertainment's official social media channels for the latest updates regarding project development and release dates.